Genealogists have a lot to learn from archivists when it comes to the personal collection of documents we accumulate. My parents gave me a box of genealogical goodies few months back as they had moved to a smaller residence without stairs. Dad said he doesn’t mind what I do with it. These statements comprise a very informal, and somewhat vague, accession record. When presented with such a collection, we often do not make notes of the provenance or context of the acquisition, but we should. Accession information is generally included in archive catalogues only as a reference or access category, as some of it may be private e.g. the donor’s identity. Acquired collections may resemble an auction job lot you bought for the one item that was not junk, so they need to be sorted and organised. In archival terms, the collection needs to be arranged. Archival arrangement collects items together in a way that preserves the provenance and context in which they were created and used. The arrangement is reflected in the structure of the catalogue. Each item is assigned a logical position within a hierarchy of categories. Taking an example from my personal archive, the marriage certificate for Joshua Arthur Smith & Beatrice Elizabeth Davis (RWC/1/6/4), was acquired as part of a discrete bundle from Winifred Clarke (RWC/1/6) in connection with the death of Raymond Walter Coulson (RWC) and filed by his administrator (RWC/1). I sorted the items in Winifred’s bundle by date of creation, as they weren’t in any order. In a big archive’s online catalogue, you might only see the entry for the marriage certificate, but you need to check the hierarchy to get the full story. My personal catalogue looks like this. RWC Raymond Walter Coulson (1922-1997) collection Papers, photographs, correspondence, memorabilia and probate documents of Raymond Walter Coulson of 322 Aston Hall Road, Aston, Birmingham, who died intestate on 24 May 1997. RWC/1 Probate file Compiled by [my dad], administrator for the estate of Raymond Walter Coulson, between May 1997 and January 1998. RWC/1/6/14 photograph – elderly woman & baby n.d.
Archival description pulls together the information needed to identify, manage, locate, and interpret the contents of a collection and explains the context of a collection’s creation and functions. Information that applies to a whole group of items is included in the record for that level, becoming more specific at deeper levels of arrangement. My example includes an item level description of the marriage certificate, and how and why it was acquired (i.e. the context) in other levels of the hierarchy. Genealogical citation geeks may recognise many of the elements of a genealogical citation are included in my catalogue. That makes me wonder why catalogue details are not embedded in digital images of documents we routinely download. Now that would really add value to online data offerings. Detailed description takes lots of time and archives receive many accessions, so do not expect archive catalogues to contain item level descriptions with names of people. Only very important collections may be fully described. The collection accumulated by Winifred, known as Winnie, is an excellent springboard for researching her family, particularly the Smith side. If you want to put a face to the name, she featured in ‘Is it George or Jack? Engagement photograph identification’. This collection identifies her parents, grandparents, and all 4 great-grandfathers. Beatrice and Joshua appear on the 1911 census at 13 Ash Tree Cottages, Alum Rock Road, Saltley, Birmingham. 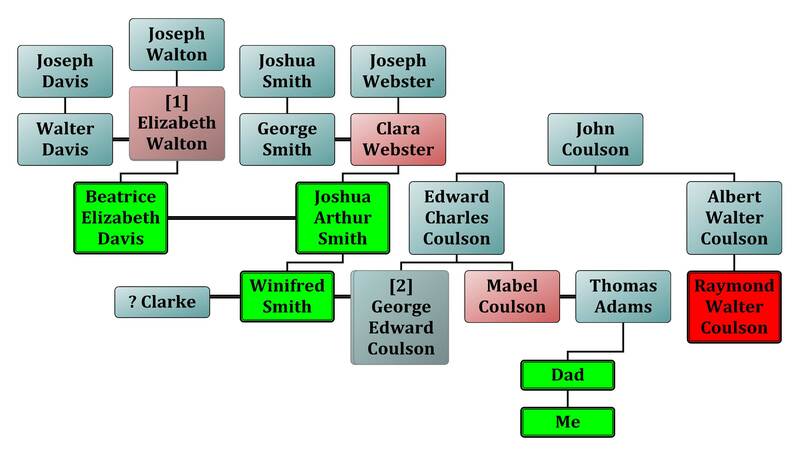 The household was headed by Clara Smith, Joshua’s mother and included 4 year old Winifred, the couple’s daughter. I can’t help wondering if the mystery photo of an old woman and baby might be Winnie and her grandma Clara. The National Archives reference for this census record is RG 14/18344/25. Fancy trying out the catalogue? Can you work out what each of the reference elements means? The 25 item refers to the number marked on the schedule, a form comprised of one sheet of paper. The catalogue does not include any item level information i.e. individual schedules, but the group of schedules. Correction 20 January 2015: The National Archives reference should be RG 14/181344 not RG 14/18172, so this post has been updated accordingly. Sue, you have touched on something I work every day to try to get through to family history researchers and genealogists: using Archival standards will improve accessibility to their own collections and make them easier to pass on to the next generation. You’ve done a fabulous job of explaining what, on the outside, seems like a simple thing but is, in fact, quite complex. The Society of American Archivists updated DACS in January 2013, addressing some much needed changes as well as incorporating now ubiquitous digital materials. My only ‘hmmm’ comment would be that I can’t think of a repository that has materials cataloged down to the item level. It’s a highly labor intensive prospect. I can see how it works for your personal collection, but might be too much or seem daunting to someone just trying to get their collection together. Having said that, cheers to you for creating an incredible personal collection!! Most genealogists and family historians first experience of archival standards is gobbled-gook references and un-intelligible catalogues and finding aids. Many never progress beyond that understanding. It took post-graduate education to de-mystify archival basics for me. Church of England, St Saviour’s church, Saltley parish, County of Warwick. Original certified copy of the Marriage Register, page 109, no 217, for Joshua Arthur Smith & Beatrice Elizabeth Davis, married 23 May 1904, issued 23 May 1904. Personal archive of Sue Adams [private address on request], RWC/1/4/4. Raymond Walter Coulson (1922-1997) collection, Probate file, Winifred Clarke late Coulson, nee Smith (1906-1996) collection. Depending on the context in which I used this certificate as evidence, I might expand the provenance information or cut it out. Archival data standards are way ahead of genealogical data standards. Thank you for the DACS update, which I did not know about. Notable is the way this and other archival standards are working towards compatibility. Which DACS elements would you use for my marriage certificate example? I notice that you commented on my post to the Evidentia Google+ Community. Evidentia is software in development towards a source based approach to genealogical research. How do the source citation templates compare to the DACS elements for this record? Are they compatible? There has been a good deal of discussion on genealogical data standards in the last couple of years, culminating in the formation of Family History Information Standards Organisation (FHISO). In order to make use of data in archival databases for genealogical purposes, genealogical data standards need to be compatible with archival standards. So, input from archivists is essential. Thank you, Sue, for your post and your clear writing filled with examples. Do you create one catalogue for all your collected documents (things your personally hold) as well as for what you have virtually acquired (scans of documents)? You have one main catalogue that includes all these items broken into sub-categories? Is this a record separate from what you have in Evidentia, or can all items with archival level of documentation be held in Evidentia? I have one catalogue with a number of fonds – top level groups such my personal documents, Raymond’s documents, etc. I am working on further fonds for digital documents. An advantage of the hierarchical system is that you can have as many levels as needed to reflect the relationships between documents. Currently I am using a spreadsheet because genealogy software does not accomodate an archival approach to recording information about documents. To my knowledge, there is no user-friendly consumer version of archival cataloge either. I have only tried Evidentia a little. To me, it seeems that Evidentia allows recording of basic source data (just what some might include in a citation) in a single level record, so I don’t think it serves as an archival catalogue. It concentrates on a different area of analysis – extracting information within a particular document. Interestingly Sue, findmypast gives the piece number for your census reference as 18344 rather than 18172 (i.e. RG14PN18344 RG78PN1103 RD385 SD5 ED25 SN25). Can you verify whether they’re right or wrong? Actually, I quoted the wrong piece number, which I have now corrected.